The Etruscan objects displayed in the various museums are very interesting and beautiful. The Etruscans were living and working the area of Italy north of Rome and south of Florence at the same time in history (9th – 2nd century BC) that the Greeks were settled in Magna Grecia (Naples south to Sicily). Though I remembered from my Art History classes that this was an archaic civilization, I didn’t remember the non-archaic parts of their civilization. The objects from their tombs are memorable for their design (many creative uses of shapes and animal forms) as well as for their decoration (use of color particularly). The Etruscans adopted much of Greek culture as the Greeks were trading partners, and many of the tomb finds from later years are actually Greek, renown for their beauty and artistry. I highly recommend a visit to one of the museums of these finds! It really has been a long time since I sat down to write in this journal…I haven’t lost interest: I’ve been foiled by technology! Finally my little computer has been resuscitated for yet another life (must be a cat!) and we’re ready to go again. We also took our jaunt to Venice and moved to a new apartment, so it has been a busy time. The children have decided to study finally. How interesting that as the prospect of returning to school looms on the ever-nearer horizon, they are able to focus on working through the material they need to finish. Makes my life easier, but our teaching days are much longer. I also no longer hear any complaints about working on Saturdays and Sundays. Not a peep! We just moved on Saturday into our new Rome apartment. Unfortunately we are here for just two weeks, because this apartment is fabulous! It is very modern and new, but in an old building with high ceilings. It is very light and airy, and has a greenhouse and a terrace! And the kitchen is fantastic! Very new and modern, and big enough for 3-4 people at the same time. 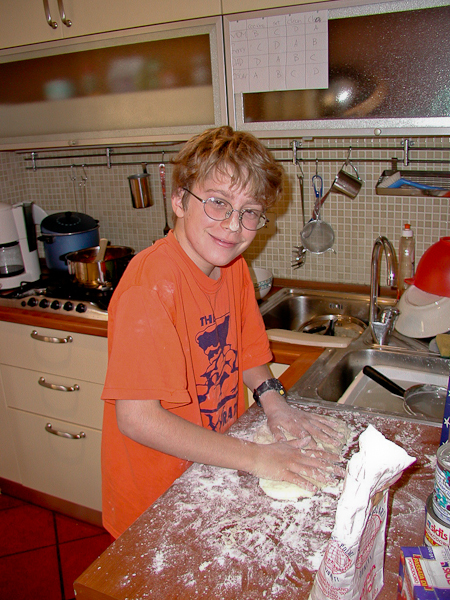 Most kids don’t learn to make gnocchi from scratch – even in Italy. We are not in the middle of everything ancient anymore, which is a very slight drawback. Instead we are just beneath the walls of the Vatican on its north side. We can fall out of bed into the Vatican Museums and are a quick two stop bus ride to where Gerry plays basketball. Our neighborhood is very residential and our street a wide, tree-lined boulevard. Our landlady is a Dutch woman who studied in the US, now married to an Italian and living here. I see her in all the decoration of this apartment – Italian design and Dutch practicality. Yesterday we had our first and only really stormy, rainy day in Rome. We spent all day in the apartment doing school work. Sunday wasn’t much different. No rain but a quiet day for studying with a walk in the afternoon to get lunch and explore a little with the children. Saturday, (I am going backwards again. Saturday was the 16th) we left our Via Baccina apartment at about noon. We couldn’t move in over here until about 6 so I commandeered the vehicle and ordered our driver (Gerry) to take us to Cerveteri, one of the sites of Etruscan necropoli. The day was spectacular (particularly notable because our weather in Venice was so awful!). We drove to Cerveteri, the town first, where we found a lechon (roast pork) vendor in the central square. We couldn’t pass up a sandwich from him. They were great! The town has a medieval castle, which always strikes me as out of place in Italy, and within its walls lies a beautiful little museum of Etruscan finds from the necropolis. The Villa Guilia Museum in Rome has many of the same types of objects, but as I said about it, there is too much to comprehend in one visit. This museum was seeable, in detail, in less than a half an hour, and created a burning curiosity to actually visit the site of all the tombs described. 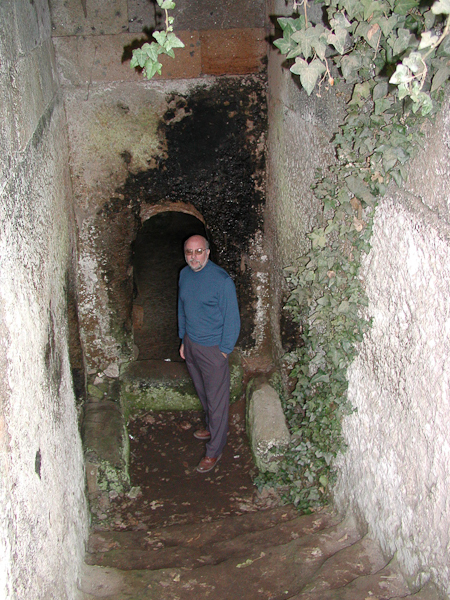 The necropolis is about 2 kilometers from the town. I admit that I went because it was something to do and something I wanted to do, but had no idea what I was going to find. (It was another of the things I have done on this trip to Rome that I didn’t do in four years of living here!) Perhaps the beautiful weather gave me a touch of spring fever, but I fell in love with the place. It doesn’t really even look like something you would find in Italy. I had the impression more than once, that this was something one might find in the rain forest jungles of South America. The cypresses give it away, but there are tombs that are over-run with vines and from which just peek glimpses of stone. Very romantic! Romantic too because of the stillness. All you can hear is the chirping of birds. You can easily imagine that was the only sound the ancient Etruscans heard as they walked the streets of this city of the dead. The tombs are laid out on a street plan, and there are large, palace-like tombs and smaller apartment-like tombs, so “city” is a good description of the place. Archeologists even discuss how the development of the tomb architecture became more and more house-like as the civilization became wealthier and more advanced. But it is the sight of the big tombs that impressed me most. They are huge, round mounds, with dirt piled up on the top. 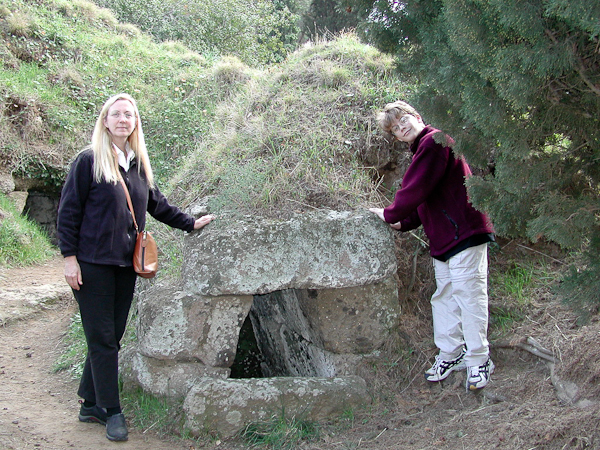 The actual burial chambers are tunneled into the “tumulus” as the mound is called. The base of most of the tombs is volcanic rock, called tufa, and the tombs are actually carved out of the rock. When you walk inside you see the smooth walls of the rock stretching up the sides and making the roof, like a cave. Later tombs, which are also bigger, have the excavated foundations and then height created by tufa blocks, set on top of each other with no mortar, and still standing 2500 years later. I didn’t tire of climbing up the stairs to the door to the tomb and then following the stairs down inside to the burial chambers, but my companions felt they had seen enough after 10 or so. We paid a visit to the book shop where a very nice young woman encouraged us to visit Tarquinia, another Etruscan site, which she said was much better than Cerveteri. We are planning a trip there with the Morrises. 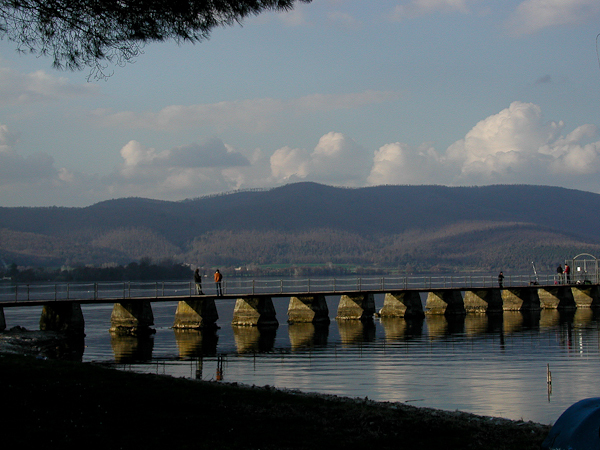 We also drove NE from Cerveteri to Lago di Bracciano, another volcanic lake, very picturesque. Notable about it was how undeveloped it is. Chapter 2 In which we go to Venice and have a wonderful time! 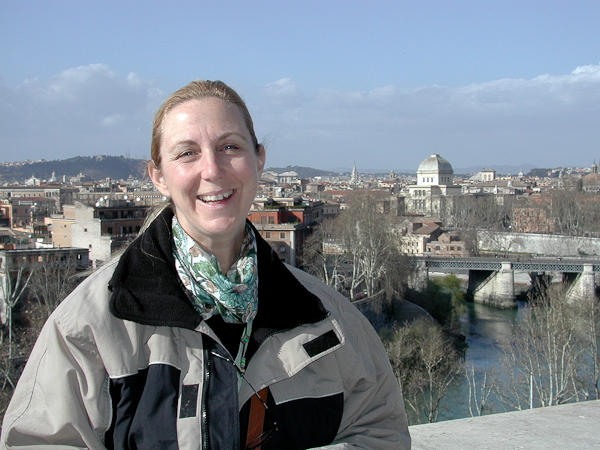 We left for Venice on Monday morning (February 10) and returned on Friday (February 15). We spent both of those days traveling in the car. The ride is about 350 miles, and we encountered fog coming and going, so it really was an all day trip. Our trip was planned around a basketball game! Gerry is playing basketball here in Rome thanks to the involvement of Laurel and Mike Dantoni. She is the daughter of a friend from San Juan and he is a coach for the Italian professional team Benetton Treviso. Their contacts helped us get Gerry a chance to train and play in Rome. We were also very anxious to see a basketball game and Laurel suggested we combine a trip to Venice to see Carnivale with a Benetton Treviso game against Athens which was the same week. Monday night, Mike and Laurel had us for dinner at their house. Meeting them both, after our long correspondence by email, was a real treat and was the highlight of our trip. I especially enjoyed hearing about their lives, how they met and where they’ve been…what it is like to be a basketball coach, in charge of a business where the “product” is the performance of the players. Tuesday we took the train into Venice. We chose to stay in a hotel in Treviso for convenience sake, a decision that worked out very well. The train ride was just a half hour. We walked from the train station towards Plaza San Marco, part of a river of humanity headed for the same place. It was quite a walk. Remember that Tuesday, February 12 was Martedi Grasso (Mardi Gras). Costumed revelers filled the streets. Masks and hats were for sale in all the stores. I found it exciting to be part of the crowd, but the children were a little overwhelmed. Our walk took us through the narrow alleys of Venice. Occasionally the buildings would suddenly open up to reveal a plaza, usually with a stone fountain in the center. Then, they’d close up again, opening slightly to give us a view up and down a canal as we crossed a bridge. There was so much to look at – and all of it so close up! Window shopping and people watching, we arrived a St. Mark’s early afternoon. We strolled around the plaza, which was filled with people in costumes. There was every type of costume imaginable: Home-made, creative costumes like the man dressed as a banana; dogs in tutus and hats; small children dressed as Disney characters, princesses and pirates; tourists with their harlequin hats and masks; period costumes from the 18th and 19th centuries; and finally, the fantastic costumes! These costumes are brilliantly attractive at first glance. Gorgeous colors, shiny fabrics, feathers and sequins make them hard to take your eyes off. But, these revelers wear masks, white masks, that cover their entire faces. It is hard even to see their eyes. After a while they take on a sinister aspect that is so disconcerting. You have no idea who is in these costumes – you can’t even tell if they are male or female. Though you find yourself attracted by the costume, the masks repel. I began to hate them. Part of the celebration was a parade of the costumes on a big stage at one end of the Plaza, including an appearance by Grace Jones (still weird). It was very difficult to see with all the people, and though we moved around, ever searching for a good vantage point, the children became frustrated with the crowd. To big Gerry’s chagrin, he was out-voted about heading home. It was already dark when we left the plaza and we shared our train ride home with many a costumed and painted Italian. Wednesday we went back to Venice, but this time to take a trip to Murano and see some glass-blowing. The kids really loved it. They were fascinated by the process and moved from “factory” to factory to see more and more. Unfortunately, our experience trying to get some lunch was very negative and colored the rest of our afternoon there. We went to 2 restaurants: In one we couldn’t get the servers to acknowledge us to give us a table, and in the other, once seated, couldn’t get them to serve us. We left both places and finally just ate a sandwich standing up! It was very disagreeable! We headed back to Venice early (about 4) because Gerry was scheduled to go with the coach to see the Bennetton team practice. Unfortunately, there was a strike going on over a railroad issue and all the trains were delayed. We just missed Gerry’s ride to the practice (at 5:30 pm, an hour and half later) but Laurel very generously offered to pick Gerry up and take him. Thursday, we got up and out early and headed back to Venice to do some sightseeing – we had not been able to see St. Mark’s on Tuesday because it was closed. I didn’t remember the interior at all so it was a pleasant surprise. We also went up to see the horses and the special gold screen. To the kids, it was just another church…they did acknowledge the gold mosaic only after we returned to Murano in the afternoon and in the glass museum, they saw how the gold mosaic tiles were made. Late Tuesday night (we always seem to go to bed late here in Europe, I went into Oscar’s room to put him to bed. Strangely, his room smelled like roses. I commented “Hmm. Smells like roses in here.” Oscar immediately looked at me and said “Why should I give you something for your anniversary?” giving away a surprise I knew nothing about! How we laughed over that! Continuing on about the Venice trip, the highlight for all of us came on Thursday night when we went to the basketball game. Gerry Jr. you can imagine! So excited that he was silent (or can you imagine that?) Oscar was practically wiggling out of his skin. Gerry Sr. and I, too, were very excited and interested in everything. Laurel picked us up and drove us out to the arena, showing us other parts of Treviso on the way. The game was good! Though Benetton never lost the lead, Athens pulled close a couple of times – worrying Oscie the most. He got so involved in the game that he had to sit next to Laurel, who could answer all his questions. After the game we were treated to dinner again with Laurel and Mike and the management of the Benetton Treviso team. The food was very good, and it was great to listen to what the management and coaches talked about after the game! It is a fascinating world beyond the parquet floor! One of the most interesting things about Treviso is that the whole town seems to be owned by the Benetton family, and one of the things that Benetton has given to the town is a fantastic sports complex. I won’t get the details right at this telling, but there were rugby courts, basketball courts, gyms, restaurants (where we ate our post-game dinner) and stores all in the same complex. Adequate parking, too! Benetton sponsors three professional sports teams, basketball, rugby and another I can’t remember, and for each of these sponsors a junior team as well – high school age kids interested and showing potential for professional play… It is quite impressive. It was hard to say goodbye to Mike and Laurel. They had been so generous with us, and we really felt as if we had made some new friends. So, coming up to the present in my narrative here, I can tell you about the last 2-3 days. There isn’t much to say really. The kids have some serious studying momentum going and Gerry and I are doing our part to feed that energy. Our TV in this apartment only gets Italian stations, so what was a huge distraction and time waster in the other apartment has been eliminated. Gerry Sr. has also managed to get himself involved with the home schooling, currently working through math with Oscar. That’s good because it frees me up to work more with Gerry, who is working through 6 different materials simultaneously. Yesterday, Gerry and I celebrated our 20th wedding anniversary! Our celebration was a quiet one – family-oriented, with school in the morning, a walk in the afternoon and a nice dinner. We tried a new restaurant for dinner which was fun, but our first choice was a restaurant where we had lunch with the Imberts when they were here. Unfortunately that place is closed on Wednesdays. Anyone into numerology? We celebrated our 20th anniversary on February 20, 2002, which in Europe is 20/02/2002 and in the US is 02/20/2002. We took one nice afternoon we had, Tuesday, and went to the Rome zoo. Not very big and obviously in the process of being modernized, it was a pleasant afternoon though not a must-see touristically speaking. We enjoyed some time spent watching the macaques. Gerry’s biology course just finished units on the evolution of primates, so once again the relevance of education is enhanced by the real world. We are currently clueless about our plans for the future. That seems so funny to admit, when so much of the beginning of our trip was planned to the day! The kids love Rome, or at least they love being settled. We know Rome pretty well and all of us have something here we particularly enjoy. It will be hard to leave again, just like it was hard to leave Great Britain and Paris when each of those came time. This time though we really haven’t been able to make a decision on how we are going to get to Spain. I had thought we could go south from Rome, visit southern Italy and Sicily. Then we go by ferry to Sardinia and ferry again to Corsica, two places I have never been. From Corsica another ferry would take us to Provence and from there we would drive overland to Madrid. The kids loathe the idea of living out of the car again, like we did traveling in France. They want to stay in Rome ’til the last possible moment and then drive all the way to Madrid and settle down again. Gerry Sr. doesn’t care what we do as long as we go to 1) the Blue Grotto (south of here) and 2) Carcassonne (Southern France). I get to try to reconcile all these preferences. Stay Tuned! By Friday, I have to admit that my enthusiasm for study marathons was waning and I was a bit stir crazy, too. It was a beautiful day, even warm enough that we sat outside on the terrace. Oscar and I “played” with some clay we bought for him and listened to Gerry read to us about the Reformation and the Counter-Reformation. It all fit so perfectly together: There we were in the shadow of the Vatican, working with terra cotta, reading about the religious upheavals of the 14th century! About 4, I escaped. With my trusty sightseeing companion (my husband), we set out on foot to discover our larger neighborhood. We walked for about two hours, seeing nothing you might find in a guide book, but checking out the big piazzas (names known to us from the bus routes), window-shopping and people watching. This is an area where Italians live. The ground floors of all the buildings are filled with shops – clothes, food, hardware, beauty parlors, etc. All the places you would expect to find where people live. We saw older people, nannies pushing prams, even teenagers. We bought a few essentials and had yet again the wonderful experience of butchering Italian with people who thought it was wonderful that we were trying. Romans maybe awful drivers, but they’re friendly people! We found a new internet cafe and spent some time trying to get our bearings on where we’ll go next…a recurring theme at this point. Friday evening we went out for dinner. Getting the kids out of the house is quite a challenge, but food usually wins them over. Afterwards they begged us to take them to the big staircase that leads up to the Vatican wall and Museum. They have developed a craze for sliding down the wide marble slabs that divide the upstairs from the downstairs. They have also gotten quite bold about their sliding acrobatics…at least Gerry has. We, like good parents, warned them to be prudent. Marble is quite hard. Despite the fact that like most parents, we are universally dorky and clueless, blood was shed upon the stairs vindicating our caution. Fortunately, it wasn’t that dramatic. Gerry managed to slap his chin down on the marble going down head first, which broke the skin, gave him quite a bump, and a real headache. No tears though. Too big for that at 15 (minus 16 days). Saturday I kept a low profile, hoping we’d take a day off from school, but Gerry was ready to study and got his first World Literature test polished off as well as another section of math. We got out of the apartment about noon, just ahead of the cleaning lady’s arrival, grabbed a slice of pizza across the street, and picked up the car for a day of wandering. Our destination today was EUR, or Exposizione Universale Romano (which it is never called! ), a suburb of Rome planned and built during Mussolini’s time. Though the “Fascist architecture,” as local people call it, has some negative associations for us, the area has nothing sinister about it. Lots of trees and wide boulevards give it a monumental feel that the buildings support. Our destination was the famous plan of Rome that is in the Museo della Civilta Romana. This is a (large) room-sized model of ancient Rome. You see it from a mezzanine that goes all around the room, and it is fascinating to study. Since there are pieces of ancient Rome all over the city, incorporated into current buildings as well as famous ruins like the Forum, this is the place to see how each of those little pieces fits into the big picture. The museum was a mixed bag of pleasure and frustration…There is no floor plan to tell where you are, where you’re going, or what you might be about to see. There are however, English explanations of what each room contains as you get to it. Everything in the museum is a reproduction, but the organization gives you a chance to see everything in its context, right alongside other objects whose original version might be in a museum in another part of Italy or the world. Fascinating too are the models of the Roman aqueducts, siege bridges, houses, tombs and famous buildings. There is another interesting plan, too. 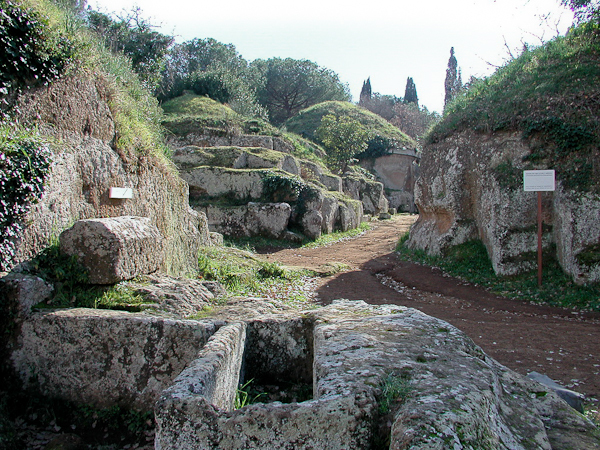 This one is Rome from Romulus’s time…before the seven hills were buried in buildings. Though the museum was deserted on a Saturday afternoon, it is definitely the type of place school groups must make good use of! We did take a walk and drive around EUR before heading out to Marino, where we had a wonderful dinner with the Morrises. We made a major mistake coming home at 11:30, thinking we could cut through the city and get home faster than taking the by-pass around the city. Traffic was worse at midnight on a Saturday than it ever could be during rush hour on a work day. Go figure! Sunday fortunately no one wanted to study! I finally have a day off. I made lunch early and Gerry Sr. and I left the house about 1:00 to explore an area still unknown to us and found some worthwhile surprises. From our new apartment we are steps from the Cipro metro stop, so we took the metro instead of a bus (hard to concede on such a gorgeous, sunny day) all the way across the city to the Piramide stop. From there we began our walk of the day. The Pyramid! Cemetery is behind it. The pyramid is right there, so you might say that we visited it. It is an ancient pyramid, ancient Roman that is. 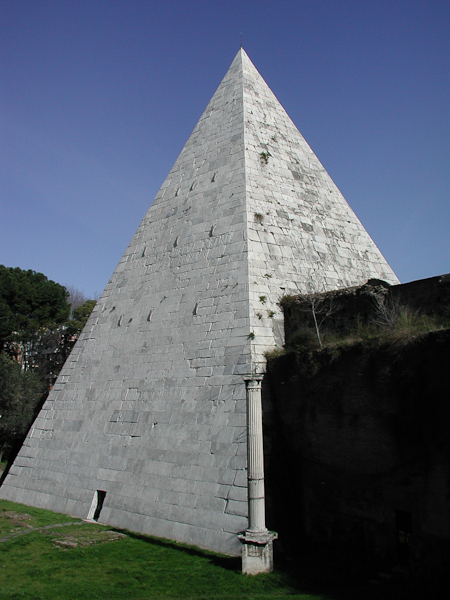 Apparently, this Roman fellow fancied himself in the glories of Egypt and built himself a pyramid for a tomb… His tomb sits in the site of a modern day cemetery, the so-called English Cemetery or Protestant Cemetery…where both Keats and Shelley are buried. I had never visited it, so yesterday we searched for the entrance and found it quite a way around the corner. The effort was worth it. The cemetery is very peaceful, full of trees and plants and green. It has a very English feel to it. The white gravestones crowd together, each with its plot of green, just as I imagine little English cottages do. I was struck by who was buried here – not in the sense of famous who’s, but who were the non-Catholics of Rome? Surprisingly many of them are young – children and many in their very early 20’s. Are these the young “milords” as one of my books calls them, who, idle in England, did their continental thing and met with disease or misfortune while in Rome, and now forever sleep beneath the towering cypress trees? With a little time, studying the inscriptions on the stones, you can get a picture of what the community is here. I can understand a love for Rome so lasting that one would chose to remain here forever, but I also feel a sadness at the lost connection with one’s family and homeland…Anyway, I think it is worth the visit. A quiet hour spent strolling through a slice of history, a beautiful garden and a visit to the tombs of two of England’s greatest poets, accompanied by a very fat, sleek and friendly cat is a wonderful hour! From the cemetery we walked on the Via Marmorata looking for a “gourmet” cheese store mentioned in my City Secrets of Rome book. We found it, closed because it’s Sunday, but vowed to return and sample its wares. You have to laugh at anything called gourmet in Italy. Everything in Italy is gourmet! I guess “specialty” cheese store would have been a better description, to distinguish it from our neighborhood cheese store, which really has a phenomenal selection of interesting cheeses, too! 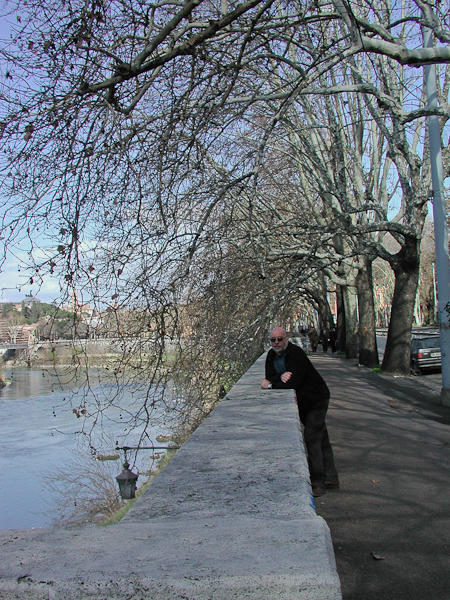 We followed the Via Marmorata to the Tiber and then headed north along the quay. We saw almost no Italians on this walk…and only a few English speakers. There were lots of people out and about but they all were eastern Europeans, and not tourists. I wonder where these people are during the week, and more to the point, how and why are they all in Rome? The last church of the four is San Anselmo. It is located sideways to a famous Roman landmark that is a must-see. 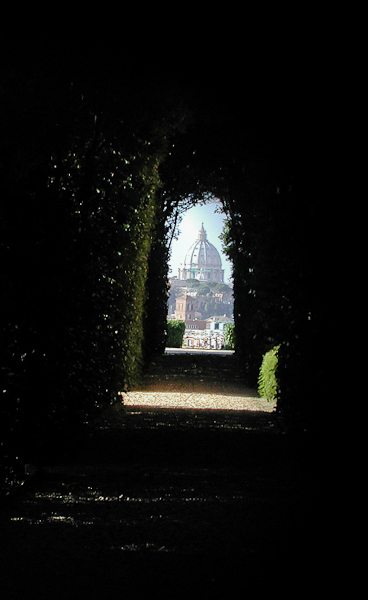 Through a keyhole of the large gate to the Garden of the Knights of Malta is an almost unforgettable view of the Dome of St. Peter’s. I had forgotten it, so when I peeked through, what a pleasure! I watched all the other visitors (and it seems that there is a fairly steady stream of them on a Sunday afternoon, though never a crowd or much of a line…) and everyone has exactly the same reaction: A little “oooh!” and a big smile. The dome is perfectly framed by the hedges in the garden. We visited the church of San Anselmo, because it was there…but it isn’t noteworthy for any architectural or artistic merit. According to my book, and information I found there, the church is noteworthy musically. Every evening, the monks sing the vespers in Latin, which is an experience I would like to try (if I can get one of my church-phobes to accompany me), and they have special concerts spring through fall. The first one is the day after we leave Rome! We wandered around the Aventine a little more, making our way to the metro stop at Circo Massimo. From there we hopped over to Piazza di Spagna (chock full of people!) hoping a nearby English language bookstore would yield some guides for planning our Spain trip. It was closed and we were tired (! ), so we returned to the metro and came home about 5. Today, another beautiful sunny day, I am hoping to get the kids out for some fresh air. All the museums are closed on Mondays, so no tourist activity, but maybe some shopping near Piazza di Spagna … Winding up our stay in Rome is tinged with the regret that it is finally over. So many things still to see and we aren’t even tired just “being” here yet. School, laundry, packing, shopping, sightseeing…we won’t get to do it all. I guess I’ll start making notes for what to do the next visit. We didn’t actually get out on Monday to do our shopping…by mid-afternoon the sky was black and rain was pelting down. We continued our studying (can you believe that?) Later, I took Gerry to basketball practice. On Tuesday, Gerry and I turned the schedule on its head and we left early to do our sight-seeing, leaving the children sleeping and relaxing, with homework assignments. We took off for the Villa Farnesina and the Galleria Corsini, two art destinations across the street from one another. The Villa Farnesina is the home of the Rafael Loggias, though it turns out that Rafael’s designs were mostly painted by other artists. They are nonetheless very beautiful and noteworthy. As one of my guidebooks says, this is a place you can look at the best of the Renaissance practically alone. The place was nearly deserted. The house was the epitome of Renaissance architecture when it was built and the loggias were open to the gardens. Now, to protect the frescoes, the loggias are walled in or glassed in. You can’t really appreciate how the indoor and outdoor spaces were related and how the loggias provided a delicate transition, except intellectually. I wish we had taken the children. (I say that about everything that we go to see without them.) The Villa had only 6 rooms to look at, perfect for their very short attention spans for art! Across the street is another Renaissance building, the Palazzo Corsini, which houses a national collection of Renaissance paintings. Not a big collection, we could probably have kept the kids involved long enough to see the more important works (One is a Caravaggio – the only one I have seen on this trip to Rome!). Our goals accomplished, we strolled a little along the Tiber and took our bus back home. Tuesday afternoon, Oscie and I went out and had our hair cut. A fun experience it turned out to be, because the ladies in the beauty parlor were smitten with Oscie! They talked to him in Italian and he answered the best he could and then they tried their English on him (in that respect it was an even draw) and he tried to understand them the best he could. There was much laughter and gaiety and we had a very fun time. Gerry Jr. was off to basketball early (6:15 practice on Tuesdays) with his dad. Wednesday, was another good solid school day, so later in the afternoon, Gerry and I went out alone leaving the boys to their computer games. Not enough time to really do any sightseeing, we returned to the bookstore near Piazza di Spagna and picked up a few guides for our trip to Spain. I have finally planned the four weeks of travel that will take us to Madrid, and with these new guides we’ll begin to make lists of the things we want to see in Spain. We found a very old copy of the Companion Guide to Madrid (you’ll remember how lavishly I praised the Companion Guide to Rome) and it looks to be the perfect guide to the area we’ll spend the most time in. Today, our plans were to meet Libby and see the Baths of Diocletian, but we’ll be doing it alone, as she is sick. More later! Well, it’s over. An idylic 2 months in Rome had to come to an end sometime. I will really miss it! We spent our last day, at the request of Oscar, seeing “something Roman.” Though our original plan had us visiting the Baths of Diocletian (the biggest of all the baths in Rome), they were closed when we got there. No reason given and the sign even said that they were supposed to be open…That’s Italy! We changed plans and went to the baths of Caracalla instead. Now, I have always pronounced Caracalla as “CAR a CAL a”, but our audio guide called him “car A cue la” (British, wouldn’t you know!) so now we all say it the British way. It was a nice warm, mostly sunny day so it was quite wonderful to be walking around outside. I was amazed that these baths are so big, yet only half the size of those of Diocletian! I guess what was really impressive was the size of the rooms. Did you know that operas are no longer performed in the baths? They stopped doing it about 7 years ago, so those of us who had that experience will have to treasure it as something we aren’t likely to ever do again. After our tour of the baths we decided to have lunch at a restaurant near our old apartment that is on top of 5-story building and purported to have a marvelous view. The restaurant was quite fancy (and over-priced though the food was very good) and empty but for us and a French-speaking couple, who the children claimed were giving them the hairy eye-ball (Remember that expression??? I am old!) The view of the Forum was worth the price of the lunch. It was interesting what a clear idea you get of the buildings, especially the Basilica Julia, from that angle. I suggest you go in the evening for a just a drink (if you can) and enjoy the view. Eat your dinner at a nearby trattoria on Via Cavour (about a block away) where the food is excellent and the price about 1/4.